Saint Margaret Mary School is renowned in the Harrisburg area for its academic excellence. For the past 60+ years our goal has been to provide the best possible Catholic education for every student. This goal is maintained through a dedicated faculty and staff committed to Catholic education. At the present time, St. Margaret Mary School maintains an enrollment of approximately 330 students. Our curriculum is based upon the graded courses of study developed by the Education Office of the Diocese of Harrisburg and approved by the State of Pennsylvania Department of Education. 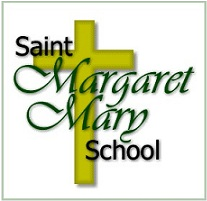 Saint Margaret Mary School includes a full-day Kindergarten through 8th grade. Our early childhood program includes two days a week morning and afternoon for 3 yr olds as well as a three day a week morning and afternoon Pre-K program. Extended care is available before and after school hours from 6:30 A.M. until 5:30 PM. Consistent with our mission, our students learn through a well-rounded curriculum including daily religion classes, computer, art, music, physical education and foreign language (Spanish). Advanced Math and Language Arts classes are offered to the 7th and 8th grades. At St. Margaret Mary School, the children receive an excellent academic training. Education research indicates that nationwide Catholic school students consistently outperform other schools on tests for math, reading and science. The Iowa Test of Basic Skills ranking of St. Margaret Mary School confirms this research. While the graduates of St Margaret Mary School go on to excel in many area high schools the majority of our students go on to attend Bishop McDevitt High School ( http://www.bishopmcdevitt.org/). St. Margaret Mary School will be participating in the Safe2Say Something, a youth violence prevention program run by the Pennsylvania Office of Attorney General. Please refer to e-Envelope for the Parent Letter for more information. You can also access the Safe 2 Say Something web site at: https://www.safe2saypa.org for further information. Tickets will not be sold at the school, but will also be available at the door on the nights of the show. For additional info on school activities visit the Calendar Events page.